Vertical Hangers for leather pieces, which substantially reduce the use of floor space and effectively increase the available drying surface area. The leather pieces move in a controlled continuous motion. They dry faster by using the hot air generated in the working area and thus the productivity is increased. Our conveyors utilises the labour force effectively. 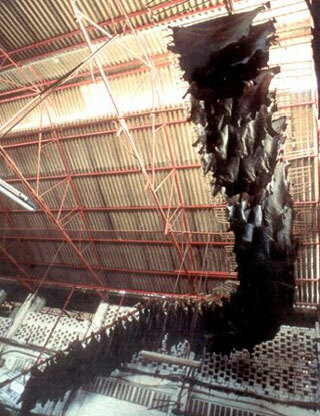 Only one person is required to load and unload the leather/hide skins, and the rest may be used for other processes. Transportation of items between work, especially in Shoe Manufacturing Units, can be effectively controlled. There by wastage of labour and material is reduced. Exported to Bangladesh, Sri Lanka, Vietnam, Uganda, Keyna.